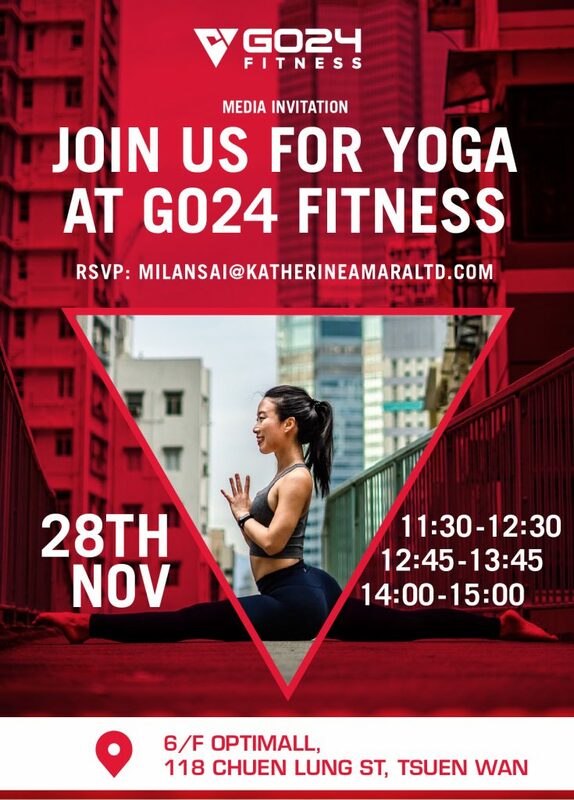 We would like to invite you for the Launch of GO24 Fitness Yoga Classes in Tsuen Wan, taking place on Wednesday, 28 November 2018, from 11:30-12:30, 12:45-13:45, and 14:00-15:00. GO24 Fitness is Hong Kong’s most premium 24 hour, no contract gym, and is now hosting yoga classes eight times a week at it’s popular Tsuen Wan studio. GO24 Fitness has launched three types of yoga classes – Hatha Yoga, Vinyasa Flow, and a Deep Release Flow class. Come and experience first hand what these yoga classes have to offer. Please RSVP by Friday, 23 November. Time: 11:30-12:30, 12:45-13:45, and 14:00-15:00.